Here is another easy egg tart recipe but with matcha flavour. I’ve even added a teaspoon of matcha powder into the tart pastry and a teaspoon to the custard to intensify the matcha fragrance. 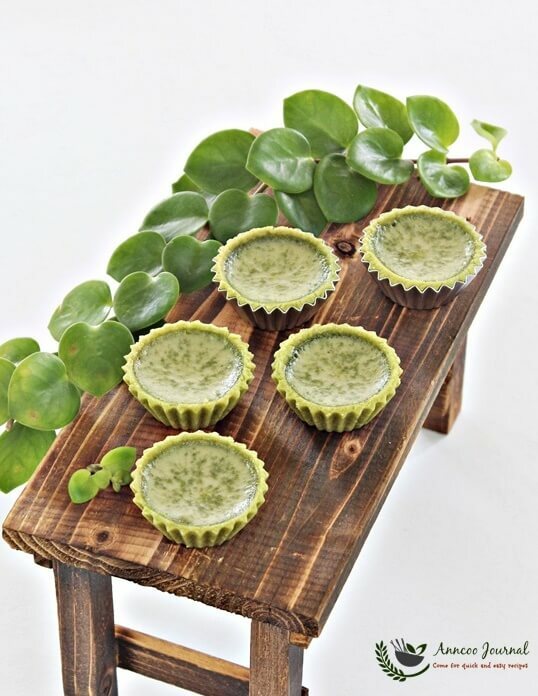 Not only does the addition of matcha powder enhances the fragrance and taste of the smooth custard, it gives a nice green colour to the little tart as well. This is very suitable to serve as a snack for the family or for a party. Tart pastry - Cream butter, icing sugar and salt until fluffy, add egg and mix well. Sift flour and matcha together onto the worktop and make a hole in the center. Add in the butter mixture. Knead to a soft dough, cover and set aside for about 20 minutes. Press a small pice of dough (15g) into each greased tart tin. Trim the edges with a sharp knife. Prick holes with a fork. Then bake in the preheated oven at 180 deg C for 10 minutes. Tart filling - Lightly boil the milk and sugar together, stir till sugar dissolved. Add matcha powder, stir well and off heat. Add egg and egg yolk into milk mixture and stir with well with a hand whisk. Then pass mixture through a fine sieve. Pour egg liquid mixture into tart shells and bake at preheated oven at 180 deg C for about 20 minutes or until egg is set. Huge matcha fan here! 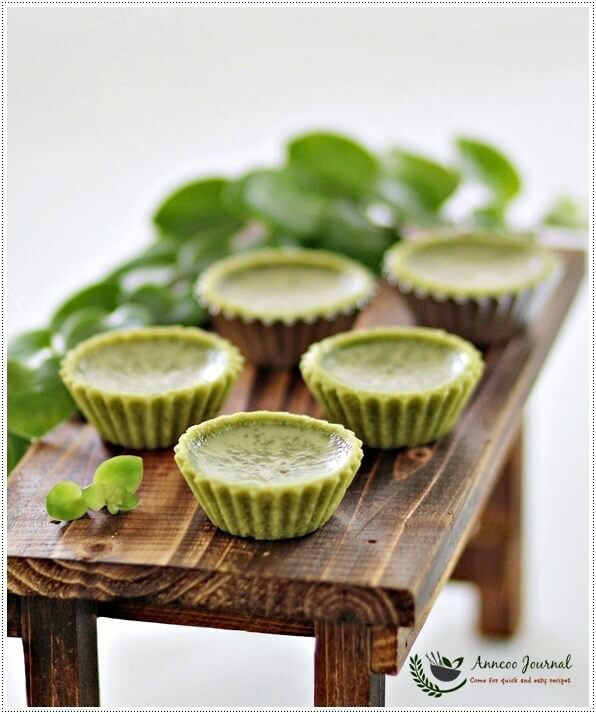 Your matcha egg tarts look scrumptious! I probably wouldn't be able to stop eating them once I started. After pre-baked the tart shell, do I have to remove the tart shell from the mould… let it cool down, then only pour the custard into the shell, then bake without the mold? Is this the proper way? Cos I've encountered once where my tarts all stick to the mold and having really hard time to remove them. Hi Gracie, No, just leave the tart shell in the mould and leave to cool. Then pour filling into it and bake.Is very easy to remove the tart once the custard is cooked. You cannot bake the tart without the shell, it'll break the tart shell because of the wet custard. If not for the title, I would think it's cendol tart. I like the green colour and also the clicks! What a beautiful and healthy creations, Ann! 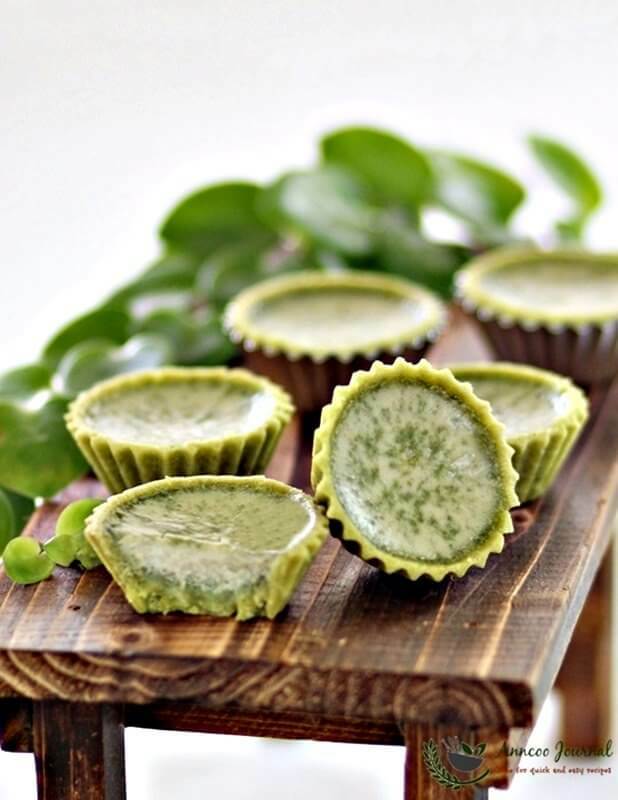 Ann, these matcha egg tarts will make green tea lovers very happy! Hi Andre, I prefer to prebake the tart shell to prevent the shell getting soggy after added the filling into it. Secondly, you can prebake the tart shell one day ahead and make the filling the next day.